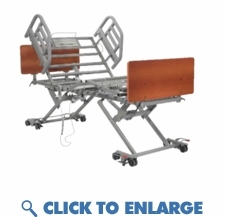 HomeLong Term Care Hospital Bed With True Low Air Loss Mattress Package 42"
The Prime Care 42" with Full Electric Hospital Bed package combines the best of the best in hospital beds and true low air loss therapy mattress systems. True Low Air Loss Therapy is commonly used in most hospitals and is loaded with all of the features available on the market today. Therapies on our True Low Air MAX 42" Wide System include on demand low air loss, alternating pressure with adjustable cycle times and pulsation pressure relief therapy. You are looking for the most comfortable hospital air mattress available. You are looking for a long term care solution that can be used for prevention - advanced stage healing. You are looking for a highly adjustable user friendly system for pain management and pressure relief therapy. You are looking for the best air mattress system available in nursing homes and hospitals. If you suffer from reoccurring bedsores, MS, fibromyalgia, burns, cancer, diabetes. The 9900 True Low air Loss System 42" width is packed with all of the features available on the market today. This True Low Air Loss System is used in our hospital accounts. The 9900 True Low Air Loss system offers an alternating pressure therapy option with continuous low air loss. This low air loss system is not only extremely comfortable but heals up to and including stage 4 bedsores and pressure ulcers. The alternating pressure therapy can be adjusted by cycle times for pain management and patient comfort. The caretaker or patient has the ability to change the cycle time from 5 mins, 10 mins, 15, or 20 mins. On Demand Low air Loss is designed to keep the patients skin cool and dry. The mattress is divided into 5 distinct pressure zones. The unique cell on cell design offers two layers of protection for the patient. The top cells offer exclusive multi zone pressure distribution based on the patients weight. The torso zone, which has the most weight reaches 100% of the set pressure. The thigh and leg zone reaches 75% of set pressure. The Head Zone which has the least weight reaches 50% of set pressure. The Heel Zone reaches 50% of set pressure for patient comfort. Bottom Lower Cells remain firm and static preventing the patient from bottoming out in the event of power failure. Seat inflation feature increases air flow to prevent the patient from bottoming out when seated. Product Name: Long Term Care Hospital Bed With True Low Air Loss Mattress Package 42"